When, as a philosopher, you concern yourself with issues of media theory, you are often confronted with the, mostly rhetorical, question as to what philosophy has to do with media. That logical, ethical, aesthetic, and epistemological issues, or those concerning the philosophy of science and of language, are genuine philosophical questions seems self-evident to us today. The word formations ‘philosophical media theory’ or ‘media philosophy’, however, sound unaccustomed, irritating, suspect. To some they may even appear to be a contradictio in adjecto. In the following I would like to argue that in conditions of modernity it is important and meaningful to construe the question concerning media as a philosophical question. Philosophical attention to the intertwinements existing between our technical media of dissemination (print, radio, TV, Internet), our symbolic media of communication (images, language, writing, music) and our media of sensuous perception (space, time) has increasingly intensified at the close of the 19th and in first decades of the 20th century. 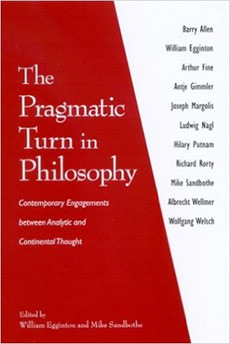 Media philosophical issues have established themselves in close connection with a new orientation in modern philosophy, which, following Richard Rorty, I would like to call the “pragmatic turn”. 1Richard Rorty, Philosophy and the Mirror of Nature (Princeton, N.J.: Princeton University Press 1979), p.149. What is meant by this is the transition to philosophical activity for which the representationalist question of our theories’ reference to reality, with a view to their cognitive or truth value, is no longer central, but instead of this the anti-representationalist question of the usefulness of our thinking within the framework of concrete, historically contingent, politically and socially determined situations of action. 2On the opposition of representationalism and anti-representationalism see Richard Rorty, "Introduction: Antirepresentationalism, Ethnocentrism, and Liberalism", in: Rorty, Objectivity, Relativism, and Truth, Philosophical Papers, vol. 1 (Cambridge, Mass. : Cambridge University Press 1991), pp.1-17; Rorty, "Representation, Social Practice, and Truth", in: Rorty, Objectivity, Relativism, and Truth, pp.151-161. Rorty’s opposition of representationalism with anti-representationalism, which I have just made use of, is to be clearly delineated from the distinction between realism and anti-realism stemming from Michael Dummett. 3Michael Dummett, "Realism", in: Dummett., Truth and Other Enigmas (London: Duchworth 1978) S. 145-165. In Rorty’s usage the distinction between realistic copy theories and anti-realistic construction theories of cognition does not serve as a synonym for the opposition of representationalism and anti-representationalism, but as an internal difference whose differentiational work is performed within the realm of representationalist positions. This is emphasized by Rorty when he writes: “I claim that the representationalism-vs.-antirepresentationalism issue is distinct from the realism-vs.-antirealism one, because the latter issue arises only for representationalists.” 4Rorty, Objectivity, Relativism, and Truth, p.2. The idea that human cognition aims primarily at providing an adequate account of reality in Rorty’s view determines both copy-theoretical and constructivist epistemologies. Although copy theory and constructivism apply different criteria of adequation and presuppose different concepts of reality, both remain within the paradigm of a representation aiming at correspondence. Whereas the adequation of a representation in copy-theoretical terms is determined by its reference to an object transcending representation, the constructivist correspondence criterion is defined immanently with respect to representation itself. The decisive question here is whether the constructivistically interpreted representation of a matter formally corresponds with the rules for the construction of something as something, which are grasped as being conditions of possibility of representation altogether. 5Heidegger had already highlighted with the utmost clarity that "through the Copernican Revolution, the ‘old’ concept of truth in the sense of the ‘correspondence’ (adaequatio) of knowledge to the being is so little shaken that it [the Copernican Revolution] actually presupposes it [the old concept of truth], indeed even grounds it for the first time" (Martin Heidegger, Kant and the Problem of Metaphysics [Bloomington/Indiana: Indiana University Press 1990] p.8). His reconstruction of Kant’s argument reads: Ontic knowledge can only correspond to beings (‘objects’) if this being as being is already first apparent [offenbar], i.e., is already first known in the constitution of its Being. Apparentness of beings (ontic truth) revolves around the unveiledness of the constitution of the Being of beings (ontological truth) [...]" (Heidegger, 8f.). Rorty contrasts the representationalist cognitive model with the anti-representationalist view that knowledge should be described not in terms of its correspondence-theoretical reference to reality, but as an element of action bound within situations of usage. Under the anti-representationalist banner cognitive feats are apprehended not as representations constructing or copying reality, but as pragmatic tools for changing reality. If one makes the pragmatic turn linked with anti-representationalism, then the representationalist distinction between cognition as realistic ‘discovery’ of reality and knowledge as constructivist ‘making’ of reality becomes irrelevant. Rorty highlights this particularly clearly in his essay Relativism: Finding and Making when he writes: “To treat beliefs not as representations but as habits of action, and words not as representations but as tools, is to make it pointless to ask ‘am I discovering or inventing, making or finding?’ There is no point in dividing the organisms’ interaction with the environment in this way.” 6Richard Rorty, Relativism: Finding and Making, Typescript, 1997, p.19. The transition from representationalism to antirepresentationalism, according to Rorty, was effected in America by the famous advocates of classical pragmatism, Charles Sanders Peirce, William James, and John Dewey, and in Europe by pragmatically thinking philosophers like Nietzsche, the early Heidegger and the late Wittgenstein. 7Cf. Rorty’s Contingency, Irony and Solidarity (Cambridge/New York: Cambridge University Press 1989). In the first section Wittgenstein, Nietzsche and Dewey are dealt with as philosophers who have developed the contingency of language, selfhood and community which is central to pragmatism: the "Wittgensteinian attitude" (ibid., p.15) stands for the "Contingency of Language" (Chapter 1), "Nietzschean pragmatism" (ibid., p.33) for the "Contingency of Selfhood" (Chapter 2), and Dewey’s pragmatic liberalism for the "Contingency of Community" (Chapter 3). On Heidegger and Wittgenstein see: Richard Rorty, "Wittgenstein, Heidegger and the reification of language ", in: Rorty, Essays on Heidegger and Others, Philosophical Papers, vol. 2 (Cambridge, Mass. : Cambridge University Press 1991), pp.50-65. On Nietzsche see also Rorty’s introduction "Pragmatism and post-Nietzschean philosophy" to this edition (ibid., pp.1-6). The main concern of pragmatic philosophers consisted of the attempt to establish a practical orientation toward the hope of a better future as the central focus of modern philosophy. This attempt was already inherent in the metaphilosophical controversy implied in the thinking of Bacon and Descartes, as well as of Kant and Hegel, about the question as to whether the centre of modern philosophy is to be seen in the theoretical, contemplative focus on cognition of the past or in the practical, active orientation toward the hope of a better future. In this spirit, Rorty states: (“Insofar as there is anything at all specific about pragmatism, then it is that it replaces the concepts of reality, reason and essence with the concept of a better human future.” 8Richard Rorty, Hoffnung statt Erkenntnis. Eine Einführung in die pragmatische Philosophie (Vienna: Passagen-Verlag 1994), p.15f. A similar characterization of pragmatism can be found with Hilary Putnam who calls “the emphasis on the primacy of practice … a central – perhaps the central – emphasis” 9Hilary Putnam, Pragmatism. An Open Question (Cambridge, Mass. : Blackwell 1995), p.52. of pragmatism. My considerations are organized in four parts. In the first part, with recourse to the founders of classical pragmatism, Peirce and James, I will demonstrate some basic features of the pragmatic turn. In the second part I will built on this and reconstruct a pragmatic concept of media in order to formulate four guiding maxims of a pragmatic media philosophy. In the third part I attempt to show how these guiding maxims are expressed in the pragmatic media philosophies of Nietzsche and Wittgenstein. Finally, in the fourth part I will try to use the four guiding maxims of pragmatic media philosophy to analyse the pragmatization of our usage of media in the digital sign-worlds of the Internet. To demonstrate some of the basic features of modern philosophy’s pragmatic turn I shall draw upon the twofold conceptual definition of pragmatism provided by William James in the second chapter of his book Pragmatism. A New Name for Some Old Ways of Thinking, published in 1907. 10James, Pragmatism: A New Name for Some Old Ways of Thinking, The Works of William James, vol. 1, eds Fredson Bowers and Ignas K. Skrupskelis (Cambridge, Mass. : Harvard University Press 1975). The original edition first appeared in 1907 in Longmans, Green & Co. in New York. Under the heading ‘What Pragmatism Means?’ James distinguishes two aspects which comprise the “scope of pragmatism” 11James, Pragmatism, p.37. : “first, a method; and second, a genetic theory of what is meant by truth.” 12James, Pragmatism, p.37. According to James the pragmatic method is “primarily a method of settling metaphysical disputes”. 13James, Pragmatism, p.28. It is a procedure for examining the meaning of controversial terms, propositions or issues. The basic idea underlying the pragmatist method is explained by James with recourse to Peirce’s essay ‘How to Make Our Ideas Clear’ 14James, Pragmatism, p.28. from 1878. 15Charles Sanders Peirce, "How To Make Our Ideas Clear", in: The Collected Papers of Charles Sanders Peirce, vol. 5, eds Charles Hartshorne and Paul Weiss (Cambridge, MA: Harvard University Press, 1960), pp.248-271. (First published in: Popular Science Monthly, vol. 12, January 1878, pp.286-302). Peirce’s classic formulation of the “pragmatic maxim” 16Peirce, How To Make Our Ideas Clear, §394, p.252. reads: “Consider what effects, that might conceivably have practical bearings, we conceive the object of our conception to have. Then, our conception of these effects is the whole of our conception of the object.” 17Peirce, How To Make Our Ideas Clear, §402, p.258. In contrast to James, Peirce, whose thinking by his own testimony took its point of departure from Kantian transcendental philosophy, 18Peirce calls himself "someone who learned philosophy through Kant" (Peirce, "What Pragmatism Is? ", in: The Collected Papers of Charles Sanders Peirce, vol. 5, pp.272-292, §412, here p.274; first published in: The Monist, vol. 15, 1905, pp.161-181). construed the pragmatic maxim in the sense of an evolutionary conception of transcendental universalism. According to Peirce it holds not only that “the whole function of thought is to produce habits of action”. 19Peirce, How To Make Our Ideas Clear, §400, p.256. But rather, going beyond this, he defines the “identity of a habit” 20Peirce, How To Make Our Ideas Clear, §400, p.257. in a transcendental manner, with a view to “how it might lead us to act, not merely under such circumstances as are likely to arise, but under such as might possibly occur, no matter how improbable they may be.” 21Peirce, How To Make Our Ideas Clear, §400, p.257. In opposition to this, for James it is the concrete and determinate, that is the particular, situationally codetermined consequences of a concept which constitute its meaning. Thus James emphasizes in his essay Philosophical Conceptions and Practical Results, 22William James, "Philosophical Conceptions and Practical Results", in: University of California Chronicle, vol. 1, September 1898, pp.287-310 (reprinted in: The Works of William James, vol. 1, pp.257-270). An abridged and revised version appeared under the title "The Pragmatic Method" in The Journal of Philosophy, Psychology, and Scientific Method, vol. 1, December 1904, pp.673-687 (reprinted in: Essays in Philosophy. The Works of William James, vol. 5, eds Fredson Bowers and Ignas K. Skrupskelis, Cambridge, Mass./London: Harvard University Press 1978, pp.123-139). which appeared in September 1898 and forms the basis of the second chapter of his Pragmatism: “I think myself that it [the principle of pragmatism – M.S.] should be expressed more broadly than Mr. Peirce expresses it. The ultimate test for us of what a truth means is indeed the conduct it dictates or inspires. But it inspires that conduct because it first foretells some particular turn to our experience which shall call for just that conduct from us.” 23James, "Philosophical Conceptions and Practical Results", in: The Works of William James, vol. 1, p.259. See also James, "The Pragmatic Method", in: The Works of William James, vol. 5, p.124. In contrast to Peirce’s universalist transcendental pragmatism, which is oriented according to the model of scientific laboratory situations, James’s contextualist pragmatism can be directly applied to the multiply determined and contingently structured conditions of everyday life as well as to the strongly traditionally determined contexts of philosophy and theology. Within the order of James’s account of pragmatism this second point of difference simultaneously refers to the second aspect of his definition of pragmatism: the genetic theory of truth. Classical pragmatism’s genetic theory of truth results from the application of the pragmatic method to the philosophical concept of truth. According to James such concepts are to be considered true as best mediate between different meanings within a historically given context on the one hand, as well as between these meanings, our concrete behavioural habits and our factual actions on the other. James dedicated “a whole lecture” 24James, Pragmatism, p.33. to the formulation of his theory of truth, namely the sixth of the altogether eight lectures in Pragmatism. In this sixth lecture, bearing the title ‘Pragmatism’s Conception of Truth’ is found James’s oft cited and controversial definition of truth: “‘The true’, to put it very briefly, is only the expedient in the way of our thinking.” 25James, Pragmatism, p.106. Cf. Putnam, Pragmatism. An Open Question, pp.5-26. As a paradigm for the pragmatic theory of truth, James elaborates the process “by which any individual settles into new opinions. The process here is always the same. The individual has a stock of old opinions already, but he meets a new experience that puts them to a strain. (…) The result is an inward trouble to which his mind till then had been a stranger, and from which he seeks to escape by modifying his previous mass of opinions (…) he tries to change first this opinion, and then that (…), until at last some new idea comes up which he can graft upon the ancient stock with a minimum of disturbance for the latter, some idea that mediates between the stock and the new experience and runs them into one another most felicitously and expediently. This new idea is then adopted as the true one.” 26James, Pragmatism, p.34 f.
With James truth no longer appears a mysterious property which accrues, or does not accrue, to an idea or proposition in all eternity. Rather, truth is a mark of performance, an index of the “power to ‘work’” 27James, Pragmatism, p.34. which a certain idea acquires, or does not acquire, in a certain context of problems. In this “truth’s cash-value” 28James, Pragmatism, p.97. consists in the networkability of a proposition, that is, in the ability of a proposition, which interprets a certain experience in a certain way, to interweave in a sensible and as systematic as possible manner with other propositions in which other experiences are expressed. As a rule this occurs only when transformations, adjustments and shifts are undertaken both in the “stock of old opinions” 29James, Pragmatism, p.34. and with regard to the interpretation of the new experience. In this way the pragmatic theory of truth simultaneously demonstrates that “either reality itself or truth itself is mutable.”( 30James, Pragmatism, p.108. The process of “veri-fication” 31James, Pragmatism, p.97. – which takes place in our thinking and speaking as permanent reorganisation, redefinition and reconstruction of our network of beliefs – constitutes reality and truth as transversal processes of entwinement which are constantly in metamorphosis. Summing up James states: “For pluralistic pragmatism, truth grows up inside of all the finite experiences. They lean on each other, but the whole of them, if such a whole there be, leans on nothing. All ‘homes’ are in finite experience; finite experience as such is homeless. Nothing outside of the flux secures the issue of it. It can hope salvation only from its own promises and potencies.” 32James, Pragmatism, p.125. Against the background of the hopes of pragmatic salvation suggested here by James I would like to emphasize the moralist founding of his thinking. Hilary and Ruth Anna Putnam have pointed out that “attention to James’s ethical intentions is essential to an understanding of him.” 33Hilary Putnam and Ruth Anna Putnam, "William James’s Ideas", in: Hilary Putnam, Realism with a Human Face (Cambridge, Mass./London: Harvard University Press 1990), p.217-231, here: p.217. And James himself noted in the closing sections of his book Pragmatism: “I cannot speak officially as a pragmatist here; all I can say is that my own pragmatism offers no objection to my taking sides with this more moralistic view (…).” 34James, Pragmatism, p.141 f. James expounded the basics of his moral philosophy in the essay ‘The Moral Philosopher and the Moral Life’. 35James, "The Moral Philosopher and the Moral Life", in: James, The Will to Believe, and Other Essays in Popular Philosophy, The Works of William James, vol. 6 (Cambridge, Mass./London: Harvard University Press 1979), pp.141-162. (Originally published 1897.) James emphasizes in this essay: “must not the guiding principle for ethical philosophy (…) be simply to satisfy at all times as many demands as we can?” 36James, The Moral Philosopher and the Moral Life, p.155. Cf. also Putnam, Realism with a Human Face, p.218. In the final lecture of Pragmatism from 1907 James comes back to his guiding moral-philosophical principle. There he describes “the pragmatistically unified and ameliorated world” 37James, Pragmatism, p.135. as “a possibility, which becomes more and more of a probability the more numerous the conditions of salvation become.” 38James, Pragmatism, p.137. A precondition for the salvational conditions actually available says James is “that each (…) agent does its own ‘level best’” 39James, Pragmatism, p.139. and that we recognize that “our acts, our turning-places, where we seem to ourselves to make ourselves and grow” are “the actual turning-places and growing-places (…) of the world “. 40James, Pragmatism, p.138. James’s moralism is a pragmatic moralism insofar as James keeps in mind the price which must be paid for moral progress: “The pinch is always here. Pent in under every system of moral rules are innumerable persons whom it weighs upon, and goods which it represses (…).” 41James, The Moral Philosopher and the Moral Life, p.156. From this, however, he infers anything but political resignation. For James is of the conviction that, if one compares today’s conditions with the past, it can be said that “a vastly greater total number of [ideals] find shelter in our civilized than in the older savage ways.” 42James, The Moral Philosopher and the Moral Life, p.156. The social experiments made throughout history have, according to James, equipped us with societal and political institutions which make us “confident that the line of least resistance will always be towards the richer and the more inclusive arrangement, and that by one tack after another some approach to the kingdom of heaven is incessantly made.” 43James, The Moral Philosopher and the Moral Life, p.157. When James opens up such global horizons he by no means does this as a relativist. The ‘we’ which James speaks of encompasses humanity and is not – as it is today, for instance, by Rorty – ethnocentrically relativized to the western world. 44Cf. Putnam: "There is not one single line in James’s writing that takes general validity’ to mean general validity in a particular culture. (...) I take it, rather, that the we’ in James’s writing is supposed to include the great majority of all human beings; and in fact, there is no evidence that he is restricting it (and some evidence that he is not restricting it) to human beings. His famous images of cosmic struggle between good and evil, which will go on until the last man’ and which may involve supernatural beings (...) suggest that the relevant community is at least as inclusive as (and potentially more inclusive than) the entire human species" (Putnam, 1992, p.239 and footnote 5, pp.333f). Therein lies a universalist aspect of James’s pragmatism, one otherwise bearing a contextualist signature. The history of our network of beliefs and the development of the forms in which we live together transcends, in James’s view, all cultural differences. James proceeds – like Peirce – from the assumption that there is a uniform history of our “ways of worldmaking”. 45Nelson Goodman, Ways of Worldmaking (Indianapolis: Hackett 1978). However, whereas Peirce takes the view that this uniformity is founded in an external force – one fatefully determined from outside the evolution of our beliefs, so that in the long run they garanteee realistic correspondence with a reality which itself is developing – James thinks that such correspondence cannot be assured by anything and also that it need not be assured. It suffices for James that we be concerned with the uniform development and internal optimization of our ways of worldmaking, through which the production of inner coherence in the framework of our network of beliefs and patterns of action is guaranteed. The question as to whether, for its part, this internal optimization is to be explained once again remains unanswered with James. A consistent pragmatic answer to this question was first provided by Rorty, who understands the generation of global coherences ethnocentrically as being the dissemination through media transmission of political vocabularies developed in western industrial nations in the Enlightenment age in Europe and America. 46In this context Rorty speaks of "the power of the rich European and American democracies to disseminate their customs to other parts of the world" as being "a power which was enlarged by certain past contingencies and has been diminished by certain more recent contingencies" (Rorty, Contingency, Irony, Solidarity, p.93). The intertwined conditions existing between our technical media of dissemination, our symbolic media of communication and our media of sensuous perception 47For the distinction between media of dissemination, communication and perception see: Mike Sandbothe, "Interactivity, Hypertextuality, Transversality. A media-philosophical analysis of the Internet", 1996, on-line pre-publication: http://www.uni-magdeburg.de/~iphi/ms/tele/e_top.html (revised and extended version forthcoming in New Media and Society). had already come into view at certain points in the classical pragmatist texts of Peirce and James quoted in the first part of my paper. Thus in his essay ‘How to Make Our Ideas Clear’ Peirce emphasizes that disregard of the pragmatic maxim often leads to convictions giving rise to one and the same habit of action, and which in this sense have one and the same meaning, one being falsely considered to be different convictions. This happens particularly when, in a representationalist manner, “mere differences in the manner of consciousness of them” 48Peirce, How To Make Our Ideas Clear, §398, p.255. are taken to be substantial differences. And Peirce continues: “Another such deception is to mistake a mere difference in the grammatical construction of two words for a distinction between the ideas they express. In this pedantic age, when the general mob of writers attend so much more to words than to things, this error is common enough.” 49Peirce, How To Make Our Ideas Clear, §399, p.256. Similar formulations are to be found in James’s Pragmatism, and here they are aimed with a critical view to the word-fetishism of metaphysics. James writes: “Metaphysics has usually followed a very primitive kind of quest. You know how men have always hankered after unlawful magic, and you know what a great part words have always played. If you have his name, or the formula of incantation that binds him, you can control the spirit, genie, afrite, or whatever the power may be. (…) So the universe has always appeared to the natural mind as a kind of enigma, of which the key must be sought in the shape of some illuminating or power-bringing word or name. (…) ‘God,’ ‘Matter,’ ‘Reason,’ ‘the Absolute,’ ‘Energy’ are so many solving names.” 50James, Pragmatism, p.31. And James continues: “But if you follow the pragmatic method, you cannot look on any such word as closing your quest. You must bring out of each word its practical cash-value, set it at work within the stream of your experience. It appears less as a solution, then, than as a program for more work, and more particularly as an indication of the ways in which existing realities may be changed.” 51James, Pragmatism, p.32. At another point in the same book James, like Peirce, establishes a connection with print culture when he delimits the attitude of pragmatism from the rationalist worldview of philosophical tradition using the following print-technology imagery: “On the pragmatist side we have only one edition of the universe, unfinished, growing in all sorts of places, especially in the places where thinking beings are at work. On the rationalist side we have a universe in many editions, one the real one, the infinite folio, or édition de luxe, eternally complete; and then the various finite editions full of false readings, distorted and mutilated each in its own way.” 52James, Pragmatism, p.124. For those dealing with the media-theoretical aspects of pragmatism, a valuable pointer for the pragmatic concept of media can be drawn from the quoted passages from Peirce and James. Peirce and James distinguish two different ways in which a word can be apprehended or used as a medium. On the one hand, from a representationalist perspective we can apprehend words as being, so to speak, magical cognitive media and mediating authoritities, by and through which the truth of being or the truth of appearances is revealed to us. This is the traditional theory of meaning in language, which – with both a pre-Kantian realistic, and a Kantian constructivist signature – is closely linked with the correspondence theory of truth. On the other hand, we can understand words from a pragmatic perspective as being media in an artisanal sense by using them as a “program for more work” 53James, Pragmatism, p.32. and as means in the sense of instruments with “which existing realities may be changed.” 54James, Pragmatism, p.32. See also James’s application of the pragmatic concept of media to the perceptive media of space and time: "Space and time are thus vehicles of continuity by which the world’s parts hang together." (James, Pragmatism, p.66). If one detaches the media pragmatic utterances of Peirce and James from their fixation on the medium of written and spoken language, then they can be used in a general sense to delimit the pragmatic media concept from the theoretical one. The ambiguity in the media concept which is pointed to indirectly by Peirce and James is already etymologically inscribed in the word ‘medium’. Whereas the Latin ‘medius’ still primarily denoted that which is ‘located in the middle’, that ‘lying between’, in a spatial sense, the appropriated English as well as German word, which can be traced back to the 17th century, develops two different fields of meaning. 55Cf. here The Oxford English Dictionary. Second Edition, vol. IX, (Oxford: Clarendon Press 1989), p.554; The Oxford Dictionary of English Etymology (Oxford: Clarendon Press 1966), p.566; Etymologie. Herkunftwörterbuch der deutschen Sprache, in: Der Duden in 10 Bänden. Das Standardwerk der deutschen Sprache, eds Wissenschaftlicher Rat der Dudenredaktion, vol. 7 (Mannheim/Vienna/Zurich: Bibliographisches Institut 1963), p.431. Within the first field of meaning ‘medium’ denotes ‘that which mediates between two things’, that is, ‘medium’ is used in the sense of ‘middle’, ‘mediator’, ‘middle link’ (in chemistry and grammar). Within the second field of meaning, which was derived from the first before establishing itself independently, ‘medium’ functions as a word denoting ‘that which serves the attainment of an end’, that is, ‘medium’ is used here in the sense of ‘means’, ‘aid’ and ‘instrument’. This ambiguity is reflected right through to the meaning, first established in the course of the 20th century, of ‘media’ and ‘mass media’ as ‘means of communication’ or as ‘conveyors’ of information, information conveying institutions’. 56Cf. the articles on ‘ Media’ and ‘Mass Medium’ in: The Oxford English Dictionary, p.542, p.439 and the article on ‘Media’ in: The Barnhart Dictionary of Etymology, ed. Robert K. Barnhart (New York: Wilson 1988), p.646. For the English heritage of the German words ‘Massenmedien’ and ‘Medium’ see: Anglizismen-Wörterbuch. Der Einfluß des Englischen auf den deutschen Wortschatz nach 1945, eds Broder Carstensen and Ulrich Busse (Berlin: de Gruyter 1994), pp.884f., 892f. From these two maxims two further maxims can be derived which point the way beyond Peirce and James to Nietzsche and Wittgenstein. So as to emphasize the connection with the first two maxims, I will continue the enumeration and speak of the two following maxims as being the third and fourth guiding maxims of a pragmatic media philosophy. The third guiding maxim states that it is only when we move in a medium whose structure makes the pragmatic character of our use of signs clear that both philosophy and common sense can be freed of the confusions in which they have become entangled in the media conditions of print culture. If this idea is referred back to the first two guiding maxims, then a dual task for media philosophy results from this as a fourth guiding maxim: One task consists of the attempt to expose and resolve the confusions arising within the intellectual culture determined by the representationalist medium of the book. The other task amounts to cooperating in the shaping of a media culture which, already as a result of its technical constitution, contributes to these confusions’ no longer even arising, because in its pragmatic use it in actu exposes and makes explicit mediality itself. Guided by these four maxims I would like to demonstrate the contribution made by Nietzsche and Wittgenstein towards the foundation of a pragmatic media philosophy. I shall begin with the first guiding maxim. It articulates the advice that a pragmatic media philosophy should avoid building up the words ‘medium’ and ‘media’ as magic cult words which allow the eternal puzzles of philosophical tradition finally to be resolved, and should instead of this pay attention to the concrete use we make, or don’t make, of media in certain situations of action. Within the framework of the implicit media philosophies of Nietzsche and Wittgenstein explicit remarks can be found to the effect that they are concerned not with creating new philosophical cult words, but rather with establishing the concrete practice of decidedly pragmatic criticism of language and media. Philosophical confusions, such is the basic idea of Wittgenstein’s late philosophy, can be unmasked by bringing into view the concrete use we make of certain words and propositions within the framework of different “language-games”. 57Ludwig Wittgenstein, Philosophical Investigations (Oxford: Blackwell 1958), p.5 [§7]. What Wittgenstein means by language-games are more or less ritualized situations of action which contain both linguistic and extra-linguistic elements and which are embedded in inclusive forms of life. 58For concrete examples, see the list Wittgenstein provides in the Philosophical Investigations (Wittgenstein, Philosophical Investigations, p.11 f. [§23]). The pragmatic turn, expressed in his attentiveness to the entwinements existing between language games and forms of life, is conceptualized by Wittgenstein when in the same context he demands: “the axis of reference of our examination must be rotated, but about the fixed point of our real need”. 59Wittgenstein, Philosophical Investigations, p.46 [§108]. In place of the traditional view that appoints mind and meaning as agents of thought and conceives of language as the medium of expression for meanings, which, for their part, are thought of as transmissive media between word and object, Wittgenstein draws attention to our factual use of signs in concrete situations of action. 60"To understand a language means to be the master of a technique." (Wittgenstein, Philosophical Investigations, p.81 [§199].) The philosophical question then no longer reads “what does this sign mean?” but “how is this sign used? What does it do?” Wittgenstein suggests understanding signs no longer as media in the sense of pure intermediary mental authorities or ideal spheres of knowledge. Instead, according to Wittgenstein, they should be viewed pragmatically as means, in the sense of instruments, which serve certain ends. The simple advice, which Wittgenstein provides in the eleventh section of the Philosophical Investigations, reads: “Think of the tools in a tool-box: there is a hammer, pliers, a saw, a screw-driver, a rule, a glue-pot, glue, nails and screws. – The functions of words are as diverse as the functions of these objects. (And in both cases there are similarities. )” 61Wittgenstein, Philosophical Investigations, p.6 [§11]. At the very beginning of the Philosophical Investigations – once again in section 11 – Wittgenstein informs us about the origin of philosophical illness, which he seeks to combat therapeutically in his later work. In doing this he formulates, at the same time, the second guiding maxim of a pragmatic media philosophy. Wittgenstein’s media philosophical answer to the question of the aetiology of philosophical illness reads: “Of course, what confuses us is the uniform appearance of words when we hear them spoken or meet them in script and print. For their application is not presented to us so clearly. Especially when we are doing philosophy!” 62Wittgenstein, Philosophical Investigations, p.6 [§11]. A quite similar aetiology for a quite similar diagnosis is provided by Nietzsche, when in a fragment from the period between autumn 1885 and early 1886 he writes: “Words remain: People believe that the concepts thus denoted do so too!” 63Nietzsche, Nachgelassene Fragmente 1885-1887, §1, in: Nietzsche, Sämtliche Werke. Kritische Studienausgabe, eds Giorgio Colli and Mazzino Montinari (Munich/Berlin: dtv and de Gruyter 1980), vol. 12, p.34. Before looking more closely at the question of aetiology I would like to append Nietzsche’s version of the diagnosis, that is, his formulation of a pragmatic media philosophy’s first guiding maxim. Like Wittgenstein, Nietzsche breaks with the ‘theoretical’ view of language, truth and knowledge in a pragmatic recourse to determinations of usefulness and conditions of interest. Thus in the Gay Science he emphasizes with regard to truth and knowledge: “We simply lack any organ for knowledge, for ‘truth’: we ‘know’ (or believe or imagine) just as much as may be useful in the interests of the human herd, the species (…).” 64Friedrich Nietzsche, The Gay Science, trans. Walter Kaufmann (New York: Vintage 1974), p.300 [§354]. The associated degradation of language, which traditionally functioned as a distinguished cognitive organ and medium of truth, to being a pragmatic instrument in the service of power interests becomes explicit when Nietzsche, in Towards a Genealogy of Morals, makes the following suggestion in answer to the question of the origin of language: “The lordly right of giving names extends so far that one should allow oneself to conceive the origin of language itself as a expression of power on the part of rulers: they say ‘this is this and this,’ they seal every thing and event with a sound and, as it were, take possession of it.” 65Friedrich Nietzsche, On the Genealogy of Morals, trans. Walter Kaufmann and R.J. Hollingdale (New York: Vintage 1989), p.26 [First Essay, §2]. Nietzsche understands images, language, writing and music as mediatic instruments of power, which are not only to be sought out in their working contexts, to be genealogically reconstructed and – as material instruments of the will to power – to be analysed, but which are simultaneously to be instrumentalized for one’s own purposes. This is also expressed in the manner in which the second guiding maxim for a pragmatic media philosophy shapes up with Nietzsche. The second maxim establishes the connection between the philosophical confusions brought about by a representationalist misunderstanding of media and modern print culture. It is the aspect of theoreticization and decontextualization of language through its fixation in the supposedly neutral medium of writing which Nietzsche foregrounds in his criticism of the 19th century’s book culture. In a note dating from summer 1883 he speaks of the 19th century as being a “scribbled age”, 66Nietzsche, Nachgelassene Fragmente 1882-1884, 8 in: Nietzsche, Kritische Studienausgabe, vol. 10, p.341. in which theoretical culture was spreading through mass media to all levels of the population. In the second of his Unfashionable Observations Nietzsche describes the self-paralysis and lethargy of action of a world determined by print, science, and journalism in the following manner: “At no point does the work give rise to an effect, but always only to a ‘critique’, and the critique likewise produces no effect, but instead is subjected to a further critique. (…) The historical cultivation of our critics does not even permit them to produce an effect in the true sense of that word, namely, an effect on life and action (…)”. 67Friedrich Nietzsche, "The Utility and Liability of History for Life", in: Unfashionable Observations, The Complete Works of Friedrich Nietzsche, vol. 2 (Stanford: Stanford University Press 1995), trans. Richard T. Grey, pp.85-167, here p.121. And in a note dating from 1882 Nietzsche concludes from this: “Another century of newspapers and all words will stink.” 68Nietzsche, Nachgelassene Fragmente 1882-1884, 3 168 in: Nietzsche, Kritische Studienausgabe, vol. 10, p.73. In contrast to James and Dewey, who had developed an exoteric and democratic pragmatism, Nietzsche spells out his Will-to-Power pragmatism in an elitist and anti-democratic manner. Nietzsche understands the “sentiment of distance”, 69Quote amended, Cf. Nietzsche, Beyond Good and Evil, p.201 [§257]. which he practices through to and in his style of writing, as being a pragmatic method of awakening the book medium from its lethargy and making books useful as instruments aiming at actions. The price Nietzsche is prepared to pay for his attempted pragmaticization of the book medium consists of the restriction to a selected and consciously limited circle of readers. In the 1872 preface for a collection of lectures ‘On the Future of our Educational Establishments’, a work, however, which was never published by him in book form, Nietzsche writes: “The book is meant for calm readers, for people who are not yet caught up in the dizzying haste of our rolling age and who do not yet sense idolatrous pleasure in being crushed by its wheels – that is, for few people!” 70Quoted from the preface to: Nietzsche, "Über die Zukunft unserer Bildungsanstalten," in: Nietzsche, Kritische Studienausgabe, vol. 1, p.649. And Nietzsche demands of the chosen few to whom his writing is directed: “Be (…) readers of this book so as, afterwards, to destroy it and to consign it to oblivion by your deed!” 71Nietzsche, Über die Zukunft unserer Bildungsanstalten, p.650. The third maxim of a pragmatic media philosophy states that it is only when we move within a medium which structurally permits the pragmatic character of our sign usage to become clear that both philosophy and common sense will be freed from the representationalist confusions which held it captive in the media conditions of book culture. We have already seen how Nietzsche’s writing in a certain sense pursues an implosive structure. Within the medium of the book Nietzsche attempts to overcome the bookish writing style. Against the “scholarly manner of bookmaking” 72Nietzsche, Nachgelassene Fragmente 1875-1879, End 1876 - Summer 1877, 23 , Kritische Studienausgabe, vol. 8, p.446. which he castigates harshly Nietzsche sets his aphoristic writing style, which, in Twilight of the Idols, he praises in the following way: “The aphorism, the apophthegm, in which I am the first master among Germans, are the forms of ‘eternity’; my ambition is to say in ten sentences what everyone else says in a book – what everyone else does not say in a book” 73Friedrich Nietzsche, Twilight of the Idols, trans. R.J. Hollingdale (London: Penguin 1990), p.114 [§51]. - Cf. also Nietzsche’s comment in a fragment from 1885: "In aphoristic books like mine there stand between and beneath short aphorisms long, utterly forbidden, things and chains of thought; and some among them might be worthy enough of question for Oedipus and his Sphinx. I don’t write essays: they are for oafs and magazine readers" (Nietzsche, Nachgelassene Fragmente 1884-1885, Juni-Juli 1885, 37 , Nietzsche, Kritische Studienausgabe, vol. 11, p.579). Less polemical, visionary and exaggerated, but amounting to a similar strategy, are Wittgensteins remarks in the preface to the Philosophical Investigations, written in 1945. With regard to the patchwork of material forming the basis of the Philosophical Investigations, published posthumously in 1953, consisting of single elements from typescripts which he repeatedly cut up and recombined in various ways, Wittgenstein wrote: “It was my intention at first to bring this all together in a book (…). After several unsuccessful attempts to weld my results together into such a whole, I realized that I should never succeed. (…) And this was, of course, connected with the very nature of the investigation. For this compels us to travel over a wide field of thought criss-cross in every direction.” 74Wittgenstein, Philosophical Investigations, Preface, p.v. To sum up it can be said that both Nietzsche and Wittgenstein experiment with writing strategies pointing beyond the order of the classical book. But at the same time their publishing remains bound to the technical medium of book printing. From this results, as the fourth guiding maxim of a pragmatic media philosophy, the task of cooperating in the shaping of a media environment which permits the binds of representationalist book culture to be overcome. The four guiding maxims of a pragmatic media philosophy I have expounded are shaped by the experience of the media transformations currently taking place. Moreover they are intended to steer towards the question of whether and to what extent a pragmatization of our use of media is taking place in the digital sign-worlds of interactive data networks. In the final part of my considerations I would like to outline briefly what I have in mind with this. I will begin with the linear textual services made available by the Net and will concentrate on the synchronous communications services of IRC, MUDs and MOOs. The linking of writing back to synchronous conversational situations in the one-to-one or many-to-many communication in MUDs and MOOs leads to a pragmatic recontextualization of the use of written signs. Using written signs, speech acts between people take place in MUDs and MOOs that would be very difficult to carry out in a book or a newspaper: people fall in love with each other, make promises to one another, argue with one another and reconcile themselves, laugh, cry, flirt with each other and do all the things that we are able to do in direct reciprocity with face-to-face communication or on the telephone. (In media which address a diffuse public in a unidirectional manner communicative acts like that can be performed only in the asynchronous mode through the interposition of letters or the telephone.) In the situation of synchronous interpersonal communication, which is characteristic of MUDs and MOOs, writing serves not primarily, or even exclusively, to make statements about something. Rather it is purposefully employed as an instrument for the coordination and conducting of shared social actions. This also applies for scientific communication. When I talk to someone in MIT’s Media MOO about media philosophy we don’t simply lecture each other about our ideas. Rather we also get to know each other as people straight away, that is, we carry out social speech acts, begin, for example, to argue or to amuse ourselves together about this matter or that. Through this our knowledge becomes socially situated, is related to our convictions, wishes, aims and hopes and is in this way disrobed of its supposedly purely theoretical signature, that is, it is pragmatically bound within and concretized with regard to our individual aims in action and life. In MUDs and MOOs even those actions which are not speech acts in the classical sense, but actions which in real life we would grasp as non-linguistic actions, are also carried out in the mode of writing. This is because in interactive writing, as a form of communication which is restricted to the medium of writing, only what takes place as a written act attains communicative reality. My smile only becomes present in a MUD or MOO when I write the sentence ‘Mike smiles’. The same applies when I drink a beer in a virtual bar or sit on the desk in the virtual office of a colleague at MIT. In all these cases it is irrelevant whether a reality is copied or constructed by the letters I type in. It doesn’t matter whether I’m really smiling, really drinking a beer, really sitting on the desk, or if I merely construct these actions. Rather what matters is that, by writing these sentences on-line, I carry out actions, that is, modify the conversational situation in the respective MUD or MOO through my actions. The pragmatization of our sign usage which is taking place in the Internet becomes even clearer when we turn to the hypertextual constitution of the World Wide Web. Characteristic of hypertexts is the fact that they point to intertextual references not merely in the mode of footnotes, but rather that by using active links they make these references constituent parts of themselves. The idea of a closed meaningful content, already suggested at the material level by the closed unit of a manuscript bound between two book covers, is made problematic by the hypertextual constitution of textual elements presented and interconnected with one another in the Internet. The positive side of this change consists of the explicit and technically manifest opening of sign usage, linked with hypertextuality, to other signs and virtual as well as real actions. Of course the fact that we can order books through the exchange of letters is not a distinguished characteristic of the World Wide Web. We can also carry out such an ordering process by post or fax. The particular feature lies in that through the Web the pragmatic dimension of our use of writing is made explicit and noticeable by the immediate answer which our order experiences in an interactive system. This brings me to an important point, which I might not have highlighted clearly enough until now: for almost all of the properties distinguishing our sign usage in the Internet as something special in relation to our everyday, non-digital sign usage it can be said that these properties are in no way things radically new, but that they simply make explicit and make us aware of things which happen implicitly and unconsciously in everyday sign usage. This also applies to the way in which we read hypertexts. Our reading is changing, hermeneutic sensitivity is being intensified, our reception of texts is becoming more intertextual, more associative and more open because we start to interpret the meaning of signs using their internal referential functions – of which signs programmed as links paradimatically make us aware – in general as a guide. We are increasingly switching to reading every sign as a potential link and are simultaneously beginning to differentiate intellectually the possible spectrum of links. With regard to the manifold reading paths which can be opened up by a good hypertext, one should speak in more concrete terms of poly-linearity instead of non-linearity. For every reading path, as a route factually trodden by a reader, is a linear sequence. In contrast to the printed book, with which linearities other than that preordained by the pagination must laboriously be inferred from tables of contents and indexes, the hypertext is structured such that already through its mediatic presentation it offers the reader a multitude of possible linearities for individual selection or independent construction. With this it approaches qualities reminiscent of Nietzsche’s and Wittgenstein’s aphoristic networks of ideas. In these a subject is not hierarchically structured and systematically worked out point for point, but is demonstrated in its pragmatic intertwinement with a multitude of other subjects and problem fields. Wittgenstein described the task of selection and interconnection underlying the composition of his Philosophical Investigations as follows: “The same or almost the same points were always being approached afresh from different directions, and new sketches made. Very many of these were badly drawn or uncharacteristic, marked by all the defects of a weak draughtsman. And when they were rejected a number of tolerable ones were left, which now had to be arranged and sometimes cut down, so that if you looked at them you could get a picture of the landscape.” 75Wittgenstein, Philosophical Investigations, Preface, p.V. And Wittgenstein concludes: “Thus this book is really only an album.” 76Wittgenstein, Philosophical Investigations, Preface, p.V. With Wittgenstein, of course, the elaborate project of a complex dramaturgy of ideas, one in which nothing is left to chance, is hidden behind this gesture of modesty. The author of the Philosophical Investigations was concerned to write several books in one book by employing intelligent interconnection of thought-scenes which are well composed and in themselves sound; that is, he was concerned to make the plural linearities, multiple paths and complex branches that advance our thinking realizable in writing too. If one applies philosophical measures to the modern writing technology of hypertext, then the efficiency of digital writing space is to be measured not least according to the standards set by Wittgenstein. It is obvious that in precisely this respect the HTML mark up language employed on the Net leaves much to be desired. If one compares the HTML-hypertexts of the World Wide Web with more refined possibilities for interconnection offered for stand-alone systems by hypertext programs such as Storyspace, HyperCard or Toolbook, then there remains much to be done here. The same applies for training of media competence in hypertextual writing, as well as for the urgently necessary development of a not only determining, but also reflective, faculty of judgement, which is an essential prerequisite on the users’ side for skilled reception of hypertextual creations. 77Mike Sandbothe, Das Internet als Massenmedium. Neue Anforderungen an Medienethik und Medienkompetenz, in: Rassismus im virtuellen Raum, eds Christian Flatz, Sylvia Riedmann and Michael Kroell, Argument-Sonderband 259, Argument-Verlag, Hamburg, 1998 (forthcoming). Mike Sandboth is a Professor of Media Philosophy at the Department of Communication of the Faculty of Humanities at Aalborg University (Denmark). Teaching in the following study programs: Humanistic Informatics, Culture and Media Studies, ICT and Learning. This text was translated into English by Andrew Inkpin.